How did Art Cashin describe the FOMC statement & the presser of Fed Chairman Powell? He said “it is a completely different Fed“. How did Economist Judy Shelton describe the attitude exhibited by Chairman Powell? She said “I was struck by the humility of Fed Chairman Powell“. Both are accurate descriptions. Go back & compare the demeanor of Chairman Powell during the presser following the December FOMC meeting vs. his demeanor this past Wednesday. It was a huge climbdown and correctly so. He has been chastened, we believe, by the intensity of the market’s reaction during both the sell off and the rally. What we all saw is a Powell who now is wedded to discretion being better than valor and a Powell who now understands how market reaction can torpedo both Fed’s models and the actual economy. In our opinion, Chairman Powell wants to position his Fed as a patient & stable institution that keeps its poise in a highly intense global economy that is facing a slowdown & a big trade fight and in an US economy that is facing intense political combat. Powell succeeded in doing so. The basic message he conveyed is that his Fed would be a supportive force in the midst of turmoil. Kudos to him. Those who babble about the Fed’s caving in to the markets do not get the basic truth that Chairman Powell has grasped. 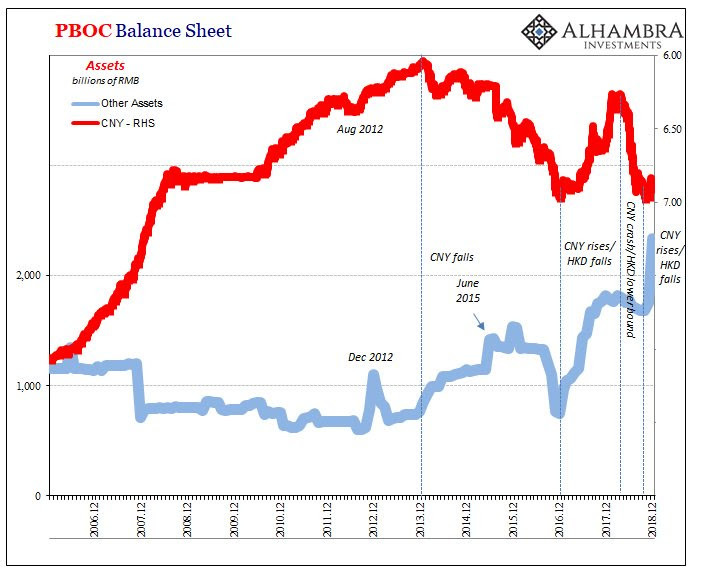 The grand plan behind Bernanke’s QE Forever was to make the economy, at least the spending power of the US economy, dependent on asset values. That has made the US economy highly vulnerable to rapid & dislocating market selloffs. That is why, we believe, Chairman Powell bent over backwards to project even a more dovish Fed during his presser than what dovish-prepared markets expected. But & at the same time, he has NOT made any commitments regarding reducing or pausing his monthly QT. Frankly, this was Powell harking back to his early comment about patience displayed by Greenspan in mid-1990s. Kudos to him for his discretion & common sense. What did the Treasury Curve say on Thursday about present vs. future? The 1-yr yield remained higher than the 7-year yield even after the 304,000 strong NFP report at 8:30 am on Friday. It was the strong ISM-Services number that finally propelled the 7-year yield up 7.5 bps on the day to close higher than the 1-year yield. But the entire 2-5 year curve remains lower in yield than the 1-year yield even after the 304K jobs number and the very strong ISM-Services number. Jeffrey Gundlach‏Verified account @TruthGundlach – Jan 29 – The most recessionary signal at present is consumer future expectations relative to current conditions. It’s one of the worst readings ever. Wasn’t December the worst month for the US stock market in a long time? And didn’t the October-December period show sustained selling in the stock market? Of course. 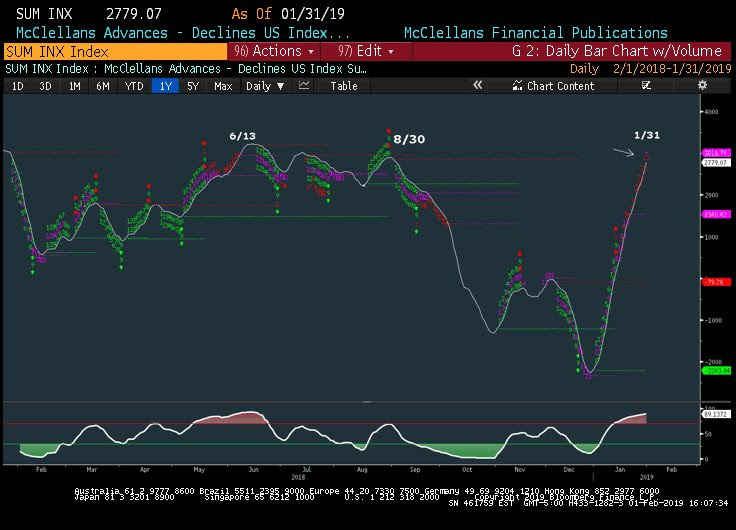 What this shows is that virtually all consumer-based economic indicators, including the above Consumer Confidence Index of the Conference Board, are now dependent on the moves in the US stock market. That is what, we believe, Chairman Powell now understands and that is the reason for his humility during his presser and his steadfast dovishness. But is the present really as strong as the 304,000 jobs added number suggests? David Rosenberg‏ @EconguyRosie – The key in today’s data was the job decline in the Household survey. Employment among working-age adults fell for the third straight month. Great recession harbinger. With this definition, shouldn’t the 2-5 year interest rate curve be lower than the 1-year rate? Yup, the Treasury market is saying. 2-year yield fell by 8 bps; 3-yr by 7 bps, 5-yr by 7 bps, 7-yr by 6 bps, 10-yr by 5.5 bps & 30-yr by 2.7 bps. But the real action in January has been in other bonds & bond-influenced stock sectors. Lisa Abramowicz‏Verified account @lisaabramowicz1 – Emerging-markets bonds are in a sweet spot again. The Fed is being patient, the world economy is relatively solid, albeit slowing, and the dollar is weakening. Not surprisingly, the biggest U.S. EM debt ETF saw the largest one-day flow yesterday since last summer. 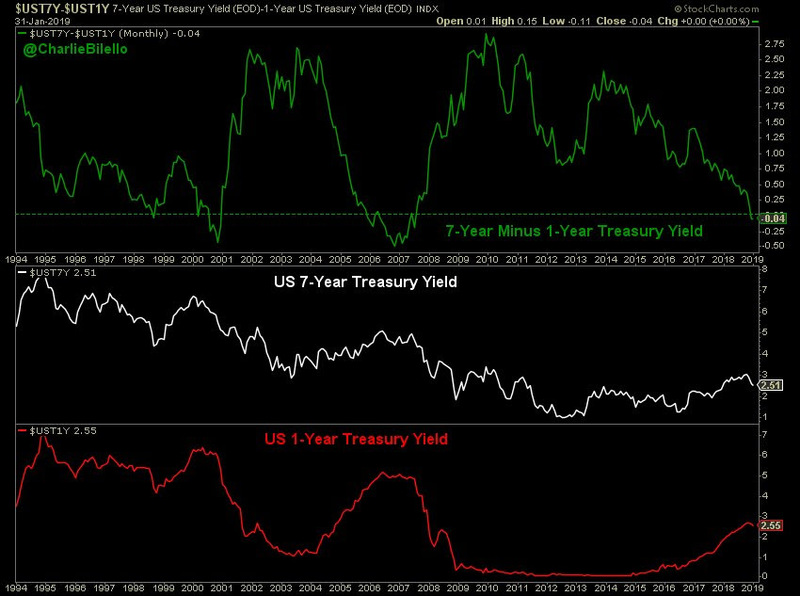 Treasury bonds have done nothing of the sort and they appear somewhat overbought. But where does the recent movement stand when you take a 40-year view? A great January for the US Stock market with S&P up 8%. What does that mean for the long and near term? Our position is simple & straight forward. The Fed being done, huge oversold condition of December 2018 should point to a good year for US stocks, perhaps like 1985, 1995, unless the US economy faces a recession. But we have no clue about the near term. And even if the above analogies prove true, that doesn’t rule out a down February. 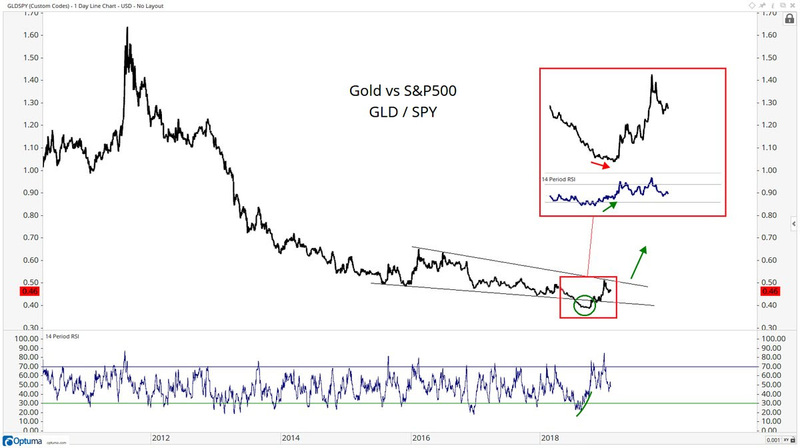 Lawrence McMillan of Option Strategist – Since there are no sell signals, we remain short-term bullish. Enjoy the ride while it lasts, employing trailing stops and rolling long calls up to higher strikes. Just don’t become too relaxed; stay vigilant. 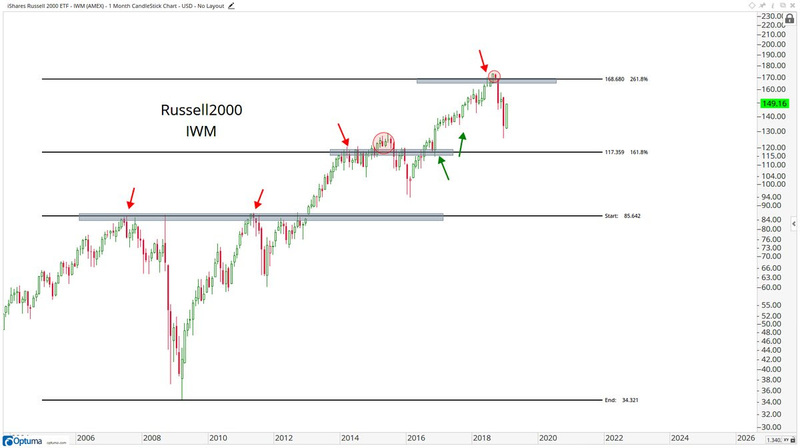 Lawrence McDonald‏ @Convertbond – Jan 30 – Would you Buy or Sell this stock? Thomas Thornton‏ @TommyThornton – Jan 31 – Hedge Fund Telemetry Trade Ideas Sheet back to net short (-8%) for the first time since mid December when positioning changed from over 65% net short from all of Q4 to 90% net long to mid January. Now, we’ve reached the end of January – the exact time when the market turned southward again in 2001. 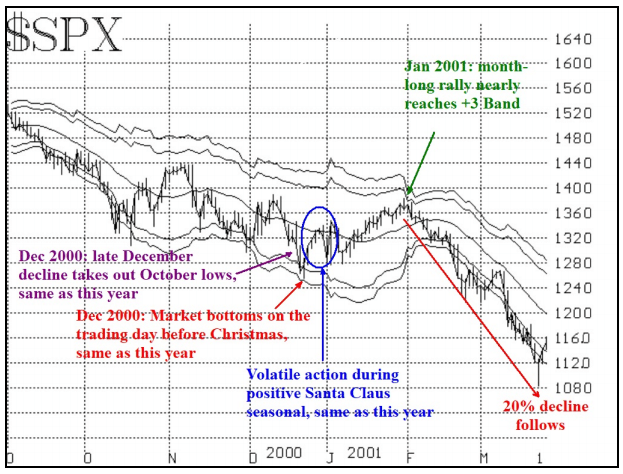 So the first four comments on the chart of 2000-2001 are applicable to 2018-2019 as well, including the last one: that the January rally has reached the +3ó “modified Bollinger Band” (mBB). 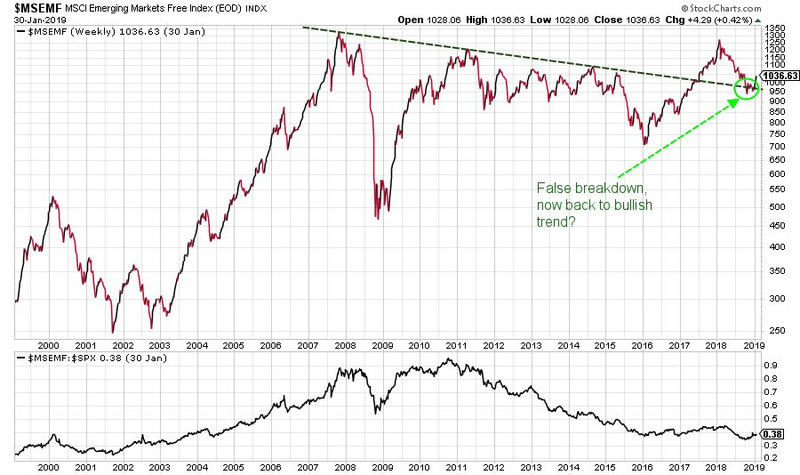 For more details, read his article The Specter of 2001 Still Haunts This Market. S&P is still the king, right? 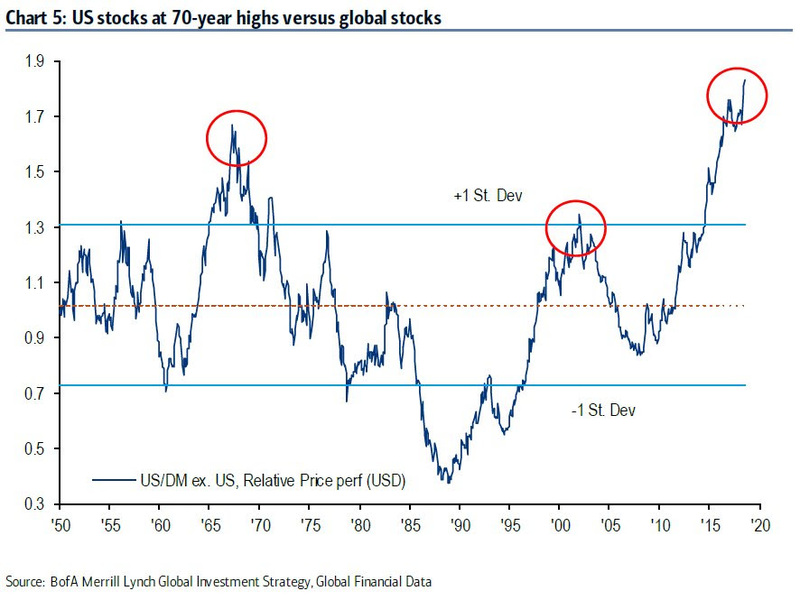 But what if we only focus on a portion of global stocks? You get the new consensus trade. 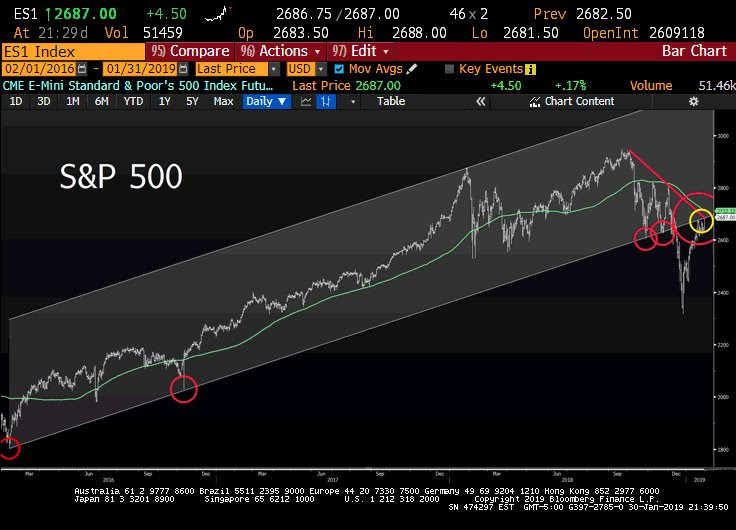 Ryan Detrick, CMT‏ @RyanDetrick – Jan 31 – Emerging markets continue to look great and should continue to lead here thanks to cheap valuations, solid earnings, and this chart. The above is a top-down macro view. How does it look from a bottoms-up micro view? adam wolfe‏ @adamkwolfe – It’s getting more difficult to ignore the sharp slowdown in the Asian tech hardware supply chain. 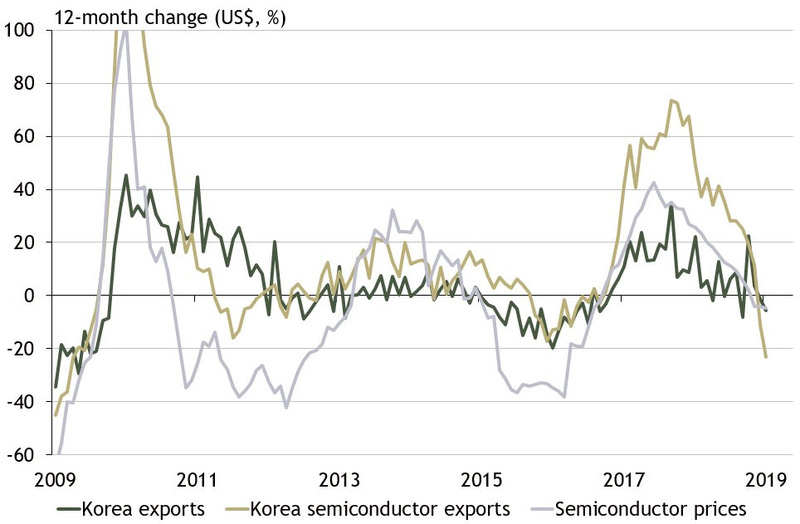 Korean semi exports were down 23%YoY nominally in January, roughly 15% in real terms based on ASR’s tracking of semi prices. What about the currency & rates? What a week for Gold? Not only did Gold rally above $1,300 & $1,315 but gold miners rallied very hard with both GDX & GDXJ up over 6% on the week. Last week Carter Worth of CNBC Options Action said Sell Amazon & Buy TLT. That worked very well. What pair trade did he suggest this Friday? 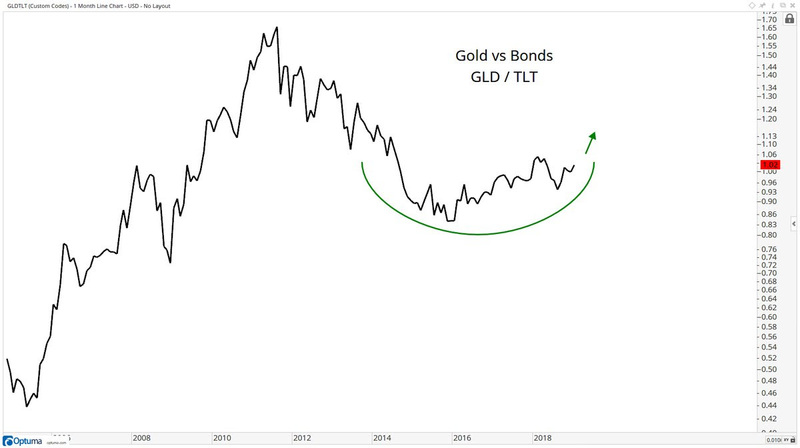 Buy Gold & Sell GOOGL. Folks, here you have a case of sell the stock but buy the product. We could not find this clip using the “search” function on CNBC.com. We found older clips but not this one. So we went to Google.com and searched for “Carter Worth on Gold on CNBC today” and Presto! So here is a pair trade for CNBC management – Short GOOGL and use the proceeds to license Google Search for CNBC.com. 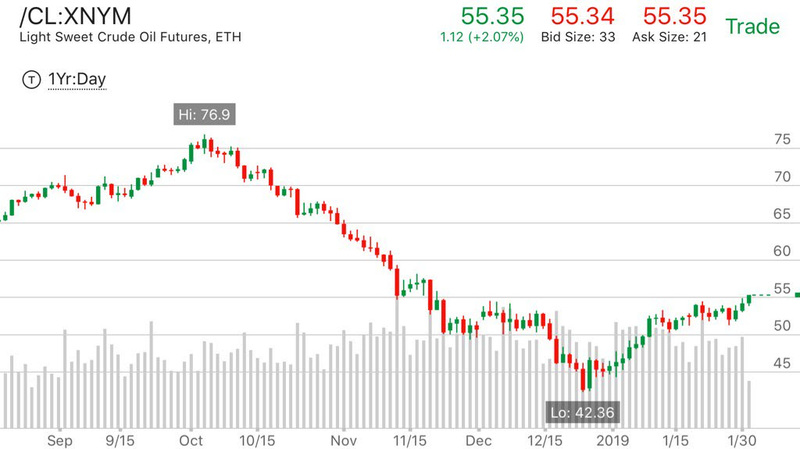 Oil was up 3.4% this week, even more than Gold. But Oil stocks were only up 3-3.5%, about half the rally of Gold Miners. 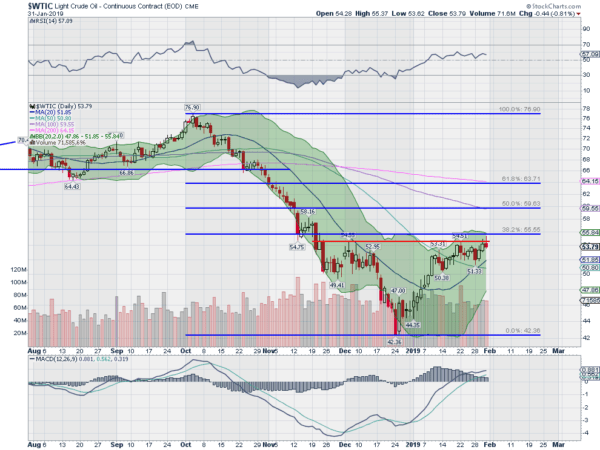 Well, Oil did close at 55.34, well above this 54.50 neckline. Last week we wondered whether Amazon would talk about their problems with law & price in India. They did in response to questions from analysts. It is strange that a company that understands the raucous politics in America and a CEO who owns a highly partisan newspaper like Washington Post have been so tone deaf to politics in the world’s most raucous electocracy, India. He actually could have learnt a thing or two from President Trump. Farmers are a very small community in America as numbers go. But President Trump understands how important they are as a part of his base. So, in every trade negotiation, he talks about how American farmers would be thrilled with his trade success. Farmers are much important as a lobby in India. That is why Prime Minister Modi came out on Friday with a large transfer of money to farmers. And farmers are connected to consumers by a huge bloc of wholesale merchants, retail shop keepers & others who assist in the supply chain. These merchants form the backbone of Modi’s party. How did Amazon miss this basic fact of life & that too in an election year of massive consequence? In any case, the problems of Amazon in India are just beginning. The next regulatory hurdle is customer data that eventually must be housed in India. That should have been a huge opportunity for Amazon & AWS. They could have jumped ahead of MasterCard, Visa & others to offer data servers in India & used that to support small retail shopkeepers too. But the long term rewards could still be huge for Amazon & Walmart-Flipkart but as Indian companies. They should look at Colgate, Unilever, P&G, Pepsi, Coke & build a similar presence for very long term success. And ideally, Amazon India should go public in India & in globally as a US ADR. We think the Indian market is like what the American market was over 100 years ago. Dominant European companies could never capture the US market at that time because that US market needed utilitarian & inexpensive products not elegant high priced European brands. That America needed Ford workers to become the market for Ford cars. India is there today. When Amazon talks about low pricing for consumers, Amazon forgot that it needs the huge retail supply chain to be customers for its products too. It might be of interest to read the section Parallels to how and why America won over Europe 100 years ago from our article on February 7, 2009 titled Will The Indian Market Be To America What The American Market Was To Europe 100 Years Ago? The comparison might be stretched in places but the basic question does have merit, we think.